Thank you for the wonderfull ideas! I purchased a pair of signed pointe shoes off of nycb’s website, and my husband and I plan to give them to our daughter opening night of Joffrey Chicago’s Nutcracker, where she is a toy soldier. I also am eying the personalized necklace, possibly a christmas gift? Also, will you do another tween gift list soon? I want to start shopping early this year. Thanks, Grace. Hi Grace, thanks for stopping by! Thats fantastic that you snatched up a pair of signed shoes! I know your daughter will display (and try them on) with pride. I will be doing another tween holiday gift list, Im compiling some ideas now. Thanks so much for the request, I didnt realize that I could be filling a niche for blog posts about tween culture….im on to it now! 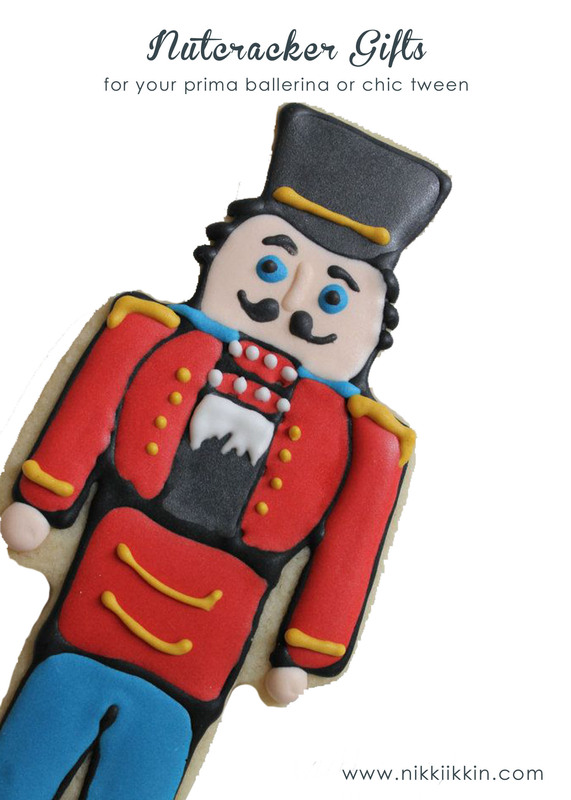 Have a great Nutcracker season! Amazing! My daughter is too young, but dreams of dancing the nutracker. She is constantly dancing around the house, and for an early christmas present we are planning a nutcracker party! Her cousins are coming into the city too visit in December, and we might have too see NYCB perform. I also saw the sale on One King’s Lane- makes me wish I had a reason to buy the tutu print… Thanks for sharing and I think Abby and her cousins will love their new jewelry!! Check out Nikki’s cookies for your party, they not only look good they are totally made from scratch and taste delicious. Hi Leyann, isnt the Nutcracker phenomenon amazing? Little girls just love it, enjoy her wonder of it! Macy danced so much as a little girl, we knew she loved it but her passion for dance CLASS didnt happen until much later. And we are so glad it did, we are enjoying her interest in it so much. How about that $5,000 sugarplum fairy costume on OKL? ?….I wish I had a reason to buy it! Im glad you found some gift ideas for your little ballerina here, have a wonderful time. Congrats! My daughter is dancing in the joffrey Chicago nutcracker this year as a toy soldier. (Hey grace! How funny we both read the same blog!) They split the childrens cast up, so each girl only has to do about 14 shows, but my daughter wishes she could do them all! The gift ideas are fantastic, and I managed to get a pair of signed pointe shoes on One Kings Lane. (By camping out at my computer!) So our daughter is kind of booked as far as presents go, but she told me that “the greatest present is getting to perform!” Love this kid! HI! Your blog has some many adorable ideas/photos…thank you for the inspiration. My daughter is 11 and is also an aspiring ballerina. Her dream is to one day dance with the NYCB! We live in Baton Rouge, LA and Morgan is dancing as a bon-bon/mouse in our Nutcracker in December–such as exciting time for the girls….and moms too. The SAB sounds exciting…….wished we lived a little closer–don’t think the BR to NY would be an easy commute, lol! I wanted to ask about the W.Whelan tutu print. I sadly missed this sale and have been on a desperate search trying to find one as a gift for my daughter. I contacted OKL and they are no longer available–the sale ended last week. Do you happen to have a 2nd source? Best wishes at SAB and your Nutcracker season. Thanks for stopping by! You might not know this but most of the teenage girls at SAB live there in dorms away from their families from all over the country. If you daughter is serious about NYCB, its possible! Thats too bad that you missed out on the OKL sale. I had a look around and I didnt see the Wendy Whelan print anywhere else. But that doesnt mean that it wont pop up again somewhere else. If you are on FB and IG you should follow Wendy, besides getting glimpses of her beautiful world you could message her and ask if she is going to offer it again. Have a wonderful holiday and congratulations to your daughter too! Hey! I love the blog! I have noticed from your instagram that Macy has a hamster. My daughter, (12) desperately wants one, but I don’t know where to start! If you had ANY tips at all it would be greatly appreciated. Thanks for the tips! I think we will spring for one soon so she can have her for christmas… she will have to be tamed though, my daughter has a younger sister who is just as excited! What cage do you use? its a good brand that you can add on to and easily get replacement parts when you need them. Congratulations to Macy! She must really love to dance, wow! My daughter is in the same boat, her nutcracker season starts on Friday. I realize your blog has really filled a niche for tween ballerinas, and I want to ask for some advice. My daughter loves to dance, and she currently dances at Hubbard Street. (Chicago) We love it, but the studio does not focus on classical ballet as much as Olivia would like. She was accepted into Joffrey Ballet, but the commute across the city would be hard enough without our busy schedule! I know she has potential and since the extra performing opportunities would make the EL ride worth it, we just might go. What are your thoughts on big or small studios, and what made you and Macy switch? Hi Ella, Thanks for your kind words. Ballet is really new for us, I didnt take it as a child so Im learning what the world is about right along with Macy. Keep the questions coming, Im enjoying it! I wish I knew exactly what kind of post to write, hopefully I figure something out. Macy’s path hasnt always been clear (really it never can be though!) we started her in ballet very young but she didnt not have the interest even though the teachers at Joffrey NYC would come out and tell us that she had something special. She even left ballet for a few years. Its really just recently that she has taken a passion in it. She enjoys the learning process, quality instruction and camaraderie she is experiencing at SAB. And at her age and maturity now she understands the legacy and opportunities that are available there too. During her absence at JoffreyNYC she went to a small neighborhood school and I think thats when she fell in love with dance (and that she preferred classical to modern ballet) because it was a little less stringent. Its also when realized we needed to get her to the best training. In our experience the small school was limiting if she was going down this path. There wasnt alot of girls that she could look up to and she was getting sized up in the small group. At SAB there are hundreds of girls, in so many different levels and I really think they are all supportive of each other. She sees older girls in the halls, stretching, & chatting, We talk about their level (every level is a different color leotard) and she sees the goals ahead of her. Even that dream goal of being professional seems a little more realistic, because she sees the NYCB dancers sometimes as guest instructors, in the performances or in passing. ( we got in the elevator with a principal dancer last week and Macy nearly melted ) Here in NYC if your daughter gets in to SAB (or JoffreyNYC) you change your life to accommodated it. I hear parents say they change to nights, drive 2 hours from CT, they make arrangement with school to leave early, etc, its pretty amazing. If you feel that Joffrey Chicago is the best around then you’ll probably find out that other parents are making the same sacrifices too. I think that if your daughter has a dream of dancing professionally putting her in a school with a known record of producing professionals is the best path. You really wont know if its right until she tries them out and if its not right I dont think you wont regret trying. Good luck to Olivia! Thank you for your kind words. We have been told that Olivia has that something special since her first years in dance, but until recently, she has never enjoyed the actual CLASS. During rehearsal for Joffrey’s nutcracker, “Clara” came up to her and told her to keep dancing, and that Olivia reminded her of herself as a girl. As you can imagine, she was still in awe that the dancer came up to her, let alone talk to her! The experience has made her ultimate goal of becoming professional seem more reachable, and it is things like that I feel are necessary to keep Olivia motivated, and although it is a difficult decision, my husband and I feel so blessed that our daughter has found her passion at such a young age. She is so mature, and I always feel proud when I see her missing out on something with her friends when she could just skip dance. Thank you for helping all of us ballet moms out! Good luck to Macy in her upcoming shows. Wow Ella, The dancer that spoke to Olivia certainly set a spark she will remember forever! That was very sweet of her to be so encouraging. I know exactly how you feel about her lack of free time too, Macy doesnt have time to hang out or reach out to her friends that she has been separated from when they started different middle schools. Theres a bag at covet dance that says ” I can’t, I have dance” its so true for this profession, its their life! Thanks for sharing, I really enjoy hearing from the other ballet moms, I wonder why so many are chatting from Chicago?? I love the blog! This doesn’t have much to do with dancing, but could you please post more about Macy’s clothes? I realize that sounds weird, but my daughter and I love her style. Khloe, you just made my day! Macy has always been our little baby doll. Like our 3 yo son, we have are super picky about what our kids wear. I cant lie, I also buy vicariously for her too. I am super happy that we can now share jewelry and look forward to borrowing the pieces I just got her for Christmas. I have given her the nickname ChicTween because there is a part of me that doesnt want to grow up and would like to dress chic in glitter or tulle, but I refrain and buy it for Macy instead. I do have a holiday wish list planned, your request has given me more motivation to get to it, thanks so much! Thank you for the reply. We are actually coming to NYC to see the NYCB Nutcracker . Arriving on Christmas day, show on Friday evening. Hope to see your lovely dancer perform! SAB is Morgan’s dream….not sure at 11, I could let her move away and live there. Hoping to get accepted into the summer program at 12 and move on from there……she is working hard to make this dream a reality! Still trying to find the Tutu print. I did contact Ms. Whelan and have not heard back. I think she might be busy?? I did want to add a suggestion to your tween ballerina Christmas list. The Count Me Healthy Ballet bracelet. It is such a wonderful idea to journal ballet progress, goals, etc….. A must for our ballerina. Hey Nikki! I think I know why your blog is attracting so many Chicago ballet moms. This post has made its way through the grapevine at Joffrey Chicago Nutcracker rehearsals. We love all your insight, thanks from all of us Chicago moms!